Repairs to a damaged portion of Evans Towne Center Park are expected to be completed by mid-August. 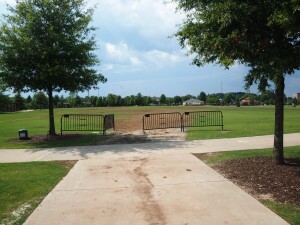 A three-acre portion of Evans Towne Center Park is under repair after suffering damages during the popular Banjo-B-Que fundraiser during Memorial Day weekend. The damages were caused by a culmination of heavy rains, foot traffic and vehicular traffic before, during and after the two-day music festival. Repairs, which are being conducted by Columbia County staff members and began in late May, include leveling the ground, filling in ruts with sand, and fertilizing and irrigating the damaged turf. “Weather permitting, we expect the area to be open to the public by mid-August,” says Cassidy Harris, the county public relations manager. While the open field area of the park is closed for repair, the playground, splash pad, walking track and dog park remain open to the public. Some events have been relocated while Evans Towne Center Park is under repair. The Summer Soakin’ Series, which is held each Wednesday from June to August, has been relocated to Columbia County Amphitheater behind the Columbia County Library, and BOOM! in the Park has been moved to Patriots Park for the Fourth of July. County officials are in talks with A B Beverage, the Banjo-B-Que promoter, about covering the costs of the remediation project. Published on June 28, 2018 in Features, People and tagged front by Kristy Johnson.